The Brother HL-2250DN is a fast monochrome laser printer which aims at small offices, producing good results at a decent speed. The printer also has automatic duplexer to print on both sides of the paper. The high capacity Brother HL-2250DN toner cartridges comes in two capacities, yielding 1,200 pages and 2,600 pages respectively. The device comes in matte black finish with rounded corners. It weighs 7 kg approx. and measures 36.8 x 36 x 18.3 cm respectively. It has a simple and well organised control panel along with four LED’s for ready, low toner, exhausted drum and general error. The printer has 250 sheet input tray and an output tray that can store up to 100 sheets of paper. At the back there are sockets for ethernet and high speed USB 2.0 connectivity. The printer comes with a printing resolution of 2,400 x 2,400 dpi with print speed up to 24 ppm. The printer has a standard 32 MB of memory and a ARM9 200 MHz processor to manage multiple print jobs. It is an energy efficient device, which consumes 65 watts of energy during operation and reduces power consumption to 0.9 watts during sleep mode. The Brother HL-2250DN is compatible with Windows 2000 Professional, Windows XP, Windows XP PE, Windows 2003 Server, Windows Vista, Windows 7, Mac OS X, and Linux operating systems. The Brother HL-2250DN printer meets the demands of busy offices by its high printing speed and good text quality. The printer supports duplex printing, USB and ethernet connectivity and also uses a two-part toner and drum design, so you don't have to change the drum every time the toner runs out. However, its slow duplex print and lack of wireless printing capabilities might not be a good choice for large business groups as they are concerned more with the productivity. How to clear paper jams? The Brother HL2250DN printer is a mono laser printer. It works great both of offices as well as homes. The printer uses Brother HL2250DN toner cartridges as consumables. The printer offers many features that are helpful for the users. But at times you may observe unwanted roller marks or smeared printouts. At times the printer will not give any printouts at all. This is caused due to paper jams in the printer. These paper jams need to be cleared out else the print quality of the printer will get affected. The printer might get damaged if these jams are not cleared sooner. Open the front cover of the printer by pressing the cover release tab on it. You will see a drum unit that contains the Brother HL2250DN toner cartridges in it. Gently take out this drum unit. The paper that has jammed will get pulled out a bit along with the unit. Pull the paper tray out and close the front cover of the printer. Carefully pull the jammed paper up and out of the machine. Open the front cover of the printer again. Now open the back cover as well. Pull the small blue tabs on both the sides of the printer, towards you. This will open the fuser cover. You will be able to see the paper now. Firmly but carefully hold the paper with both hands and pull it out of this fuser unit. Make sure that you touch the internal parts of the printer only when the printer has cooled down a bit after use. Pull out the duplex tray from the printer and pull the jammed paper out from the printer or the tray. Put the tray back into its place. Bits of paper might be there in the drum unit as well. Open it by pushing down the blue lock lever on it and take theBrother HL2250DN toner cartridges out. Clear off any jammed paper with the drum unit. Put the cartridge back into the drum unit and and push it till it clicks into place. Put this drum unit back into the printer. Put the paper tray back into its place and close the front door of the printer. Q. What are the weight and dimensions of Brother HL-2250DN printer? A. The printer weighs approx 7 kg and measures 36.8 ✕ 36 ✕ 18.3 cm. Q. Is it risky to use compatible Brother HL-2250DN toner cartridges instead of the original ones? A. No, there is nothing wrong with using the compatible toner cartridges. The compatible toner cartridges produce as clear prints as the original ones. In Fact, it is a better option to use the compatible ones. They cost much less without affecting the quality of our printer. Q. What are the media types supported by this printer? A. The printer supports plain paper, thin paper, thick paper, bond paper, labels and envelopes. Q. I lost my toner cartridges bought for Brother HL-2250DN printer. Now I’m looking forward to buy another Brother HL-2250DN toner cartridges of low cost. Can you help me finding one? A. You can find compatible toner cartridges at Printerinkcartridges.ie. The compatible ink cartridges available are tested and ensure good quality print results as the originals. By using these cartridges, you can also save money on your business. Q. What is the power consumption of this printer during operation and during sleep mode? A. The printer consumes 65 watts of energy during operation and 0.9 watts during sleep mode. Q. Which toner cartridges can be used for replacing Brother HL-2250DN toner cartridges? Q. Is this printer suitable for handling multiple print jobs? A. Yes, this printer is suitable for handling large print jobs for the reason that it supports duplex printing, high-speed printing, ethernet & USB connectivity and a ARM9 200 MHz processor for managing multiple print jobs. Q. What is the page yield of Brother HL-2250DN toner cartridges? A. These toner cartridges comes in two cartridges with the page yield of 1200 and 2600 pages respectively. Q. How should I clean the pickup roller of Brother HL2250DN? Are there any precautions to be followed? Finally, plug in the power cord and turn on the printer. Q. Hello, I ordered Brother HL-2250DN toner cartridge pack 2 days ago. As nobody was there at home to receive the delivery I suppose the package returned. In that case, would you charge extra for the next delivery? A. Please be informed that we make all our deliveries through Fastway Couriers. In case nobody is present at the address to receive the order, Fastway Couriers will try delivering the second time. On two unsuccessful deliveries, the third delivery will be done with an extra charge of €4.95 inclusive of VAT. Q. What is the shelf life of Brother HL-2250DN toner cartridges? Can I do something to extend the life of toner cartridges when not in use? A. In general, the shelf life of all ink cartridges (including Brother HL-2250DN toner cartridges) ranges between 6 to 12 months. To prevent the cartridges from getting damaged please place them in a cool environment away from heat, excess humidity and sunlight. If you follow these precautions you can easily store the cartridges for more than a year and extend its shelf life. Q. Can you tell me the page yield capacity of these compatible Brother HL-2250DN toner cartridge? A. Yes, the page yield capacity of these compatible Brother HL-2250DN toner cartridge (TN2220) is 2600 Pages. Q. I own a Brother HL 2250DN printer. It is in good condition and I print almost 50 prints a day from it. Now all of a sudden it stopped printing and showing an error “Cooling Down (COOLING DOWN)”. Can you help? A. The message (Cooling Down) indicates that an obstacle is in front of the exhaust outlet (ventilation hole) or the fan is not operating correctly. Make sure that you can hear the fan in the machine spinning and that the exhaust outlet (ventilation hole) is not blocked by something. Case 1: Fan is spinning. If the fan is spinning, remove any obstacles that surround the exhaust outlet (ventilation hole), and then leave the machine turned on but do not use it for several minutes. Case 2: Fan is not spinning. If the fan is not spinning, disconnect the machine from the power for several minutes, then reconnect it. Q. Would I be able to take colour prints from my Brother HL-2250DN printer if I replace this TN2220 black Brother HL-2250DN toner cartridge with other compatible colour cartridge? A. 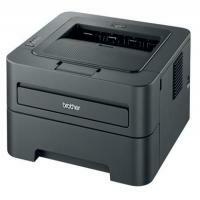 The Brother HL-2250DN printer model is a monochrome laser printer which can only print in black. No other original or compatible colour cartridges are available for it. All the compatible toner cartridges that work fine with your Brother HL-2250DN printer are listed above on this page. Q. I have just installed a new Brother HL-2250DN toner cartridge and my printer says “NO TONER”. Please help? A. When the NO TONER message appears, a yellow LED indication is shown on the control panel next to “Toner”. This error message appears when the machine fails to detect the Brother toner cartridge. Make sure the drum unit and toner cartridge assembly is installed properly. If the drum unit is installed without the toner cartridge, please go to the step 4. Push down the green lock lever and take the Brother HL-2250DN toner cartridge out of the drum unit. Put the toner cartridge firmly into the drum unit until you hear it lock into place. If you put it in properly, the green lock lever will lift automatically. Put the drum unit and toner cartridge assembly back into the machine again. Q. Would you be able to ship this COMPATIBLE BROTHER TN2220 - 2 PACK to India? A. Thanks for the question. Unfortunately, we only deliver to addresses within Rep.Ireland & Northern Ireland. Q. Can you tell me the supported operating systems for the Brother HL-2250DN printer? A. The Brother HL-2250DN is compatible with Windows 2000 Professional, Windows XP, Windows XP PE, Windows 2003 Server, Windows Vista, Windows 7, Mac OS X, and Linux operating systems.